The Perham Collection of Early Electronics includes several examples of original Lee de Forest electronics apparatus. 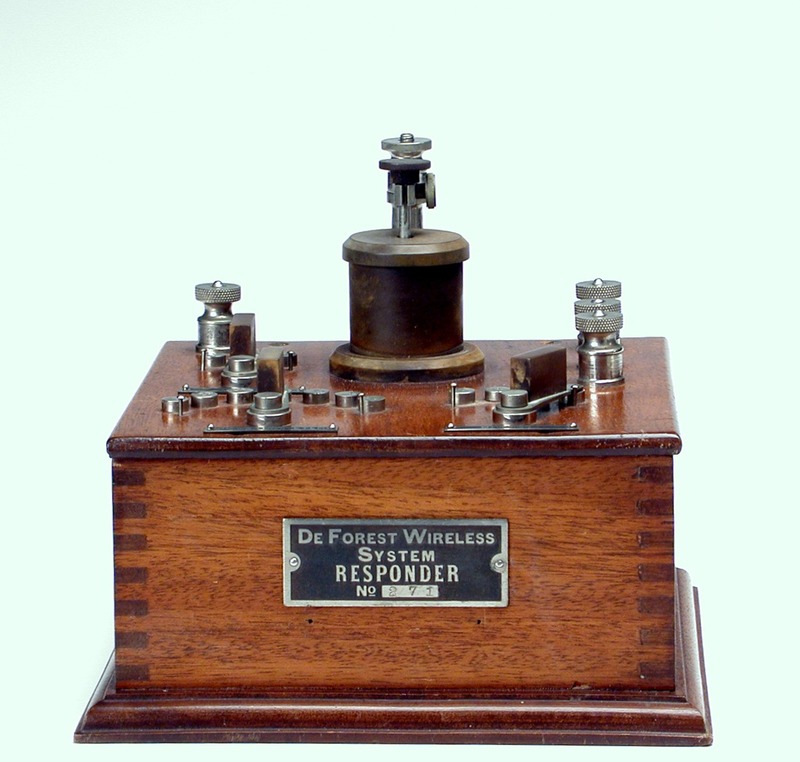 The collection’s de Forest “Responder” (which he first called a “spade” or “sponder”) is perhaps the best example known of de Forest’s several costly attempts to work around Marconi and Fessenden patents. De Forest had founded his American de Forest Wireless Telegraph Company in 1901 to manufacture wireless telegraph equipment and to operate wireless stations, and he continued to experiment with equipment already covered by patents. The de Forest responder was a variant of Reginald Fessenden’s patented electrolytic, or liquid barretter, detector. 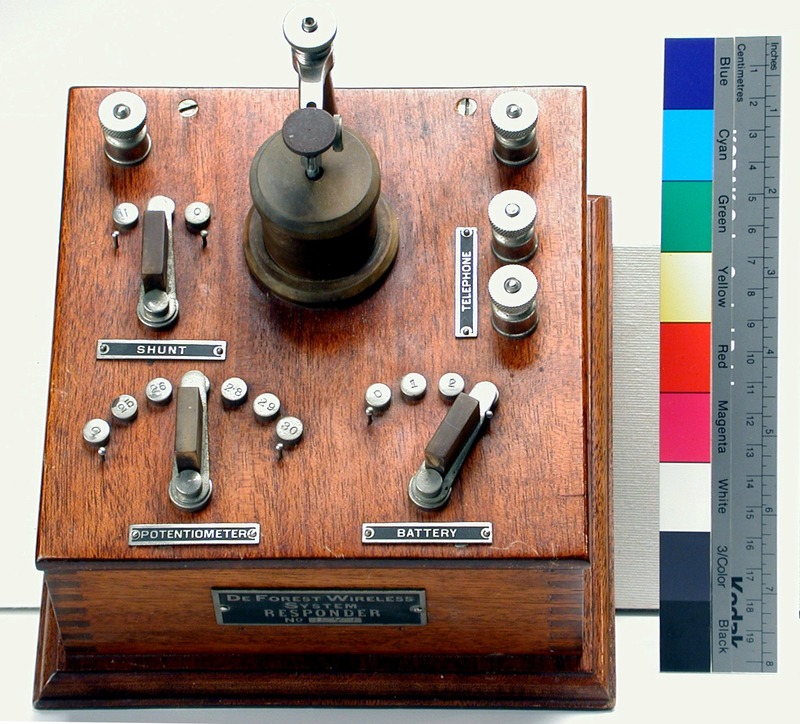 Marconi’s mid-1890s coherer detector had been the only detector in use until 1902, when the Marconi Company introduced their magnetic detector. Fessenden subsequently invented an electrolytic detector, which used a platinum wire sealed in a glass rod and dipped into a dilute acid solution. Early in 1903, de Forest developed an electrolytic detector that used a piece of platinum leaf sealed into glass, which he called a “spade electrode,” and later a “responder,” for commercial use. De Forest’s spade detector soon became standard equipment not only in de Forest wireless stations but in receivers supplied to the U.S. Navy. Fessenden sued de Forest for patent infringement, and in 1906, after a three-year court battle, won an injunction to stop de Forest from manufacturing and/or using the spade electrolytic detector. De Forest substituted a less sensitive carborundum crystal (a patent held by H. H. Dunwoody, an officer of the de Forest Company) for the spade detector, but as it turned out, the electrolytic detector was soon replaced by more sensitive and stable galena, silicon, and other crystal detectors. The Fessenden suit turned out to be an expensive one, and, soon after, de Forest resigned as chief engineer of the company. He was paid a severance of $1,000 (of which his lawyer kept half) for most of his patents – excluding his vacuum tube detector, then considered worthless. Ironically, reworking the tube detector, de Forest patented his landmark three-element “audion” as a non-oscillating detector/amplifier in 1906, following Fleming’s 1904 intention of the two-element valve. The Perham Collection’s de Forest responder is complete and in excellent condition. It measures approximately 6.5 by 7.0 inches. It includes an identifying plate: Deforest Wireless System Responder, No. 271. The bottom of the wooden cabinet is signed by de Forest, with the date September 12, 1955. A June 1953 photograph in the collection shows him holding it, identifying it as one used in the 1904 St. Louis World’s Fair and forty years later found in a Phoenix, Arizona, freight office. (In 1970, an extensive collection of de Forest’s papers, including many photographs, was given to the Perham Foundation by Marie de Forest). The de Forest responder was provided by Vance Phillips, an early collector from Santa Barbara, in 1977. The bulk of Vance Phillips collections are now with the New England Wireless and Steam Museum in East Greenwich, Rhode Island. An early copy of the de Forest responder also exists. While showing his responder at the U.S. Navy Yard in Brooklyn in 1903, de Forest left one of the units on loan. While the Navy tried out the responder, a navy sop man made a copy of the original. This copy was later “rescued” by Navy electrician Austin Parkhurst when he left the Navy, and remained in his possession until persuaded to place it with the Denison University Radio Club. That replica, first thought to be an originla, was acquired by Charles Brelsford, K2WW(sk), of Tempe, Arizona, around 1988. Brelsford then wrote, “Whether this was the copy or original I am not completely sure, for there are two small nail holes in the side where a plate might have been. Either way, it is a unique collectors’ item.” (“The DeForest Responder,” Arizona Antique Radio Club News, 5:3, Spring 1988).